I once opened a fortune cookie to find this written inside: "You are a lover of words. Someday you should write a book." While that would be an ideal scenario, I think my ADD mind and writing style are better suited for a blog at the moment. By day, I write for work and relate publicly. By night, if I'm not up to my usual shenanigans, I write for me. And now, for you. I hope you enjoy. Well, I remember. And I remember when Netflix started bankrolling their own content, with now-household names like Orange Is The New Black, House of Cards, Gilmore Girls: A Year in the Life (hallelujah!). After finishing the Gilmore Girls revival this weekend (insert sobbing emoji), I decided to check out The Crown, also from Netflix. I’m two episodes in, and Oh My Gawd. Y’all. Sooooooooo good!!! Each episode is like an hourlong movie. The cinematic quality is spectacular. The soundtrack is divine. The acting, the costumes… I’m eating it up with a royally big spoon. And thank you, Netflix. You keep doing you, you rockstar. Do you struggle to wake up every morning? Tired of hitting the snooze again and again? Wish you could rocket out of bed to greet the day? Forget those high-priced alarm clocks that we all know don’t work. Instead, allow me to introduce you to the world’s best, most effective alarm clock! GUARANTEED to get your heart pumping with adrenaline, your eyes wide open, your brain rid of any sleep, and your feet on the floor and sprinting! 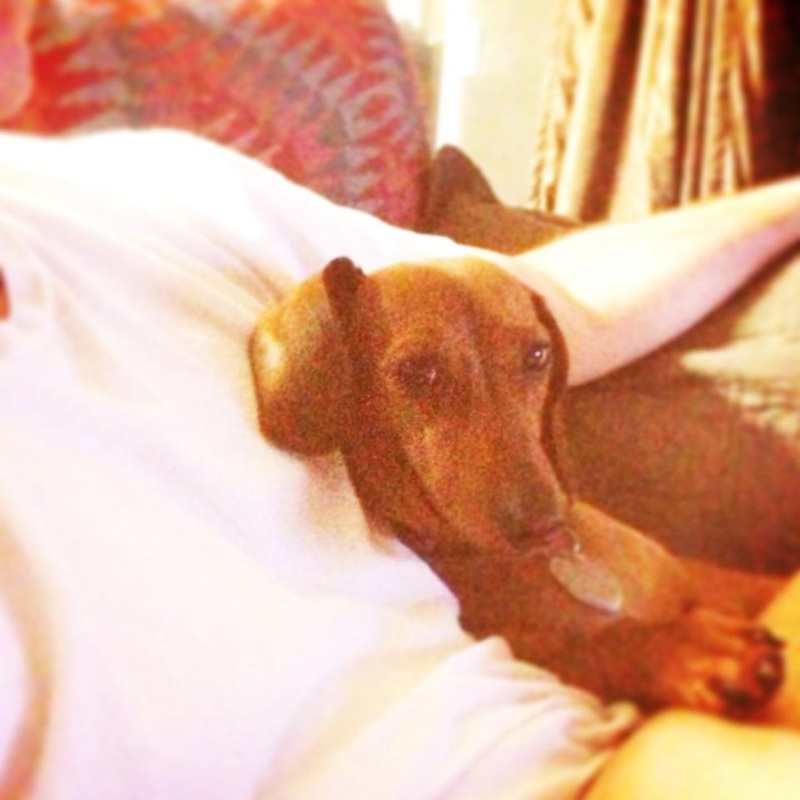 At a time not requested nor controllable, dog will crawl up to your head and and begin to barf onto your pillow. At the first guttural sound of “bleeeeeeechhhhh,” you will awake with heart-exploding alacrity, screaming “NOOOOOOOOO!! !” It’s like magic! Go to work! Embrace the day! You are AWAKE! The Barfing Dog! is patent-pending. This is my first post in a very long (verrrrry long) time. About a year ago, someone very special asked me to marry him, and in February 2013, we tied the knot. 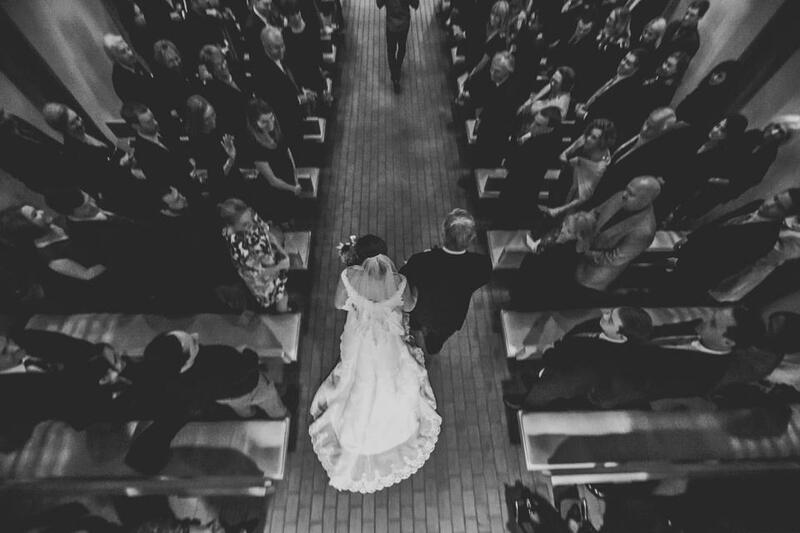 And, with about a month under my belt, I can say that I love being married. To know that, while life is short, our lives will now forever be intertwined is a cool, surreal feeling. I feel like I spent my life heretofore as a sprinter, and now I’m settling in for the marathon, and it’s a total shift of mind, body, and spirit. Even in this newness, there is hard work, but there is joy. And in each day, I want to do good, to do right, and to laugh. My husband is well-regarded in his family (and by me) as a most excellent giver of gifts. I have no doubt that on my birthday next week, I will receive a healthy mix of the practical and the frivolous/pretty. I’ve made comments here and there about what I might like to receive, and he nods, filing the information away in that elephantine memory of his. “Oh?” I coyly replied, sitting on the couch as he puttered around in the kitchen. At this point, I’m staring forward, and he’s a few feet behind me. I can feel his eyes on the back of my head, and the horror that washes over him as he realizes what he’s just said is palpable. I say nothing, as he quickly covers his tracks, assuring me that he will certainly be getting me another present, too. 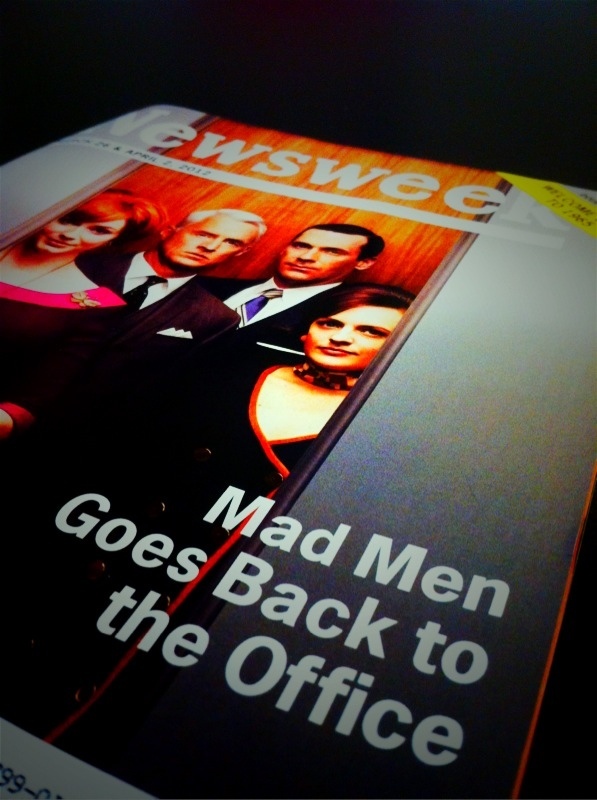 Mad Men returns this Sunday night (eek! ), and Newsweek took the opportunity to create a retro-yet-current issue, highlighting real time stories, up-to-date news compared with where we were in the 60’s, plus a few photos and reports from over 40 years ago. I have never consumed a magazine quite so… rabidly. I am feasting on every single page: what is new, what is old? It is a vortex of eras, and I am spin, spin, spinning in it. The best part? The ads. 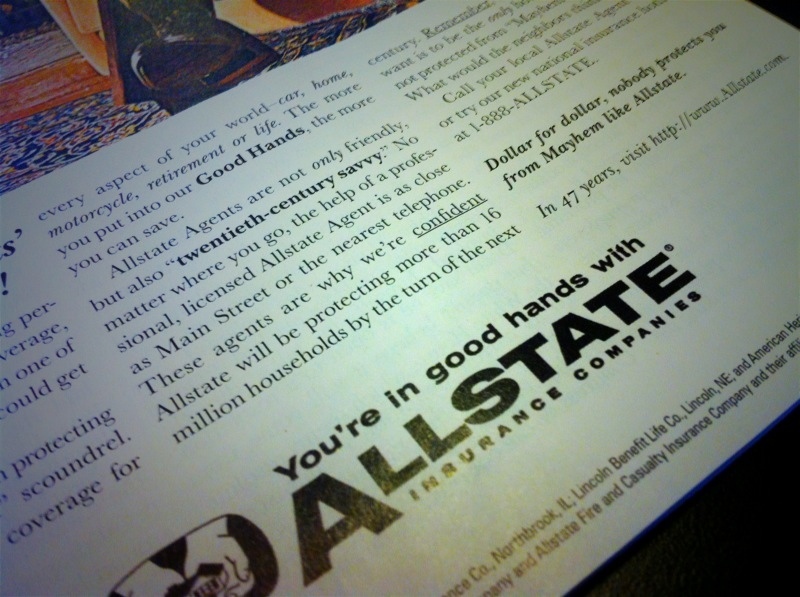 I’m still pouring over the pages, but when I came to this Allstate ad, I just HAD to stop and write this post. Up until the below ad, the prior displays were cool but disconcerting, leaving my brain on unsure footing: QR codes and web addresses juxtaposed with decidedly-1960s set-ups. But, in my opinion, Allstate and their hilarious Mayhem nailed this issue; it is perfectly, delightfully anachronistic when it ends with “In 47 years, visit http://www.Allstate.com.&#8221; Genius.